Daily Pre-Shift inspections are a requirement by OSHA to ensure the lift truck that is about to haul around thousands of pounds, is safe to do so. In addition to compliance, catching small service issues before they blossom into giant repair or incident headaches is a protection to your bottom line. 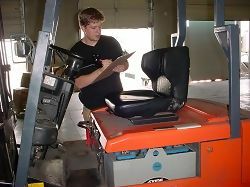 Daily Inspections – Are your forklifts being inspected and documented before each shift by your operators? Visit our Training page and checkout our Checklist Caddy, that will help you keep track of each insepction. Listed below are a few of the key components to inspect on a daily basis before operating your lift truck. Forks – When was the last time your forks were inspected for wear, cracks or other unsafe conditions? 10% wear in forks, reduces the safe lifting capacity of your lift trucks by 20%! We hope this list helps you to understand that when it comes to a safe forklift fleet, operator training is just one facet of a safe and productive working environment. If you want a partner that will work with you to make sure you achieve this, Toyota Forklifts of Atlanta should be your next call. When it comes to forklift safety, parts and preventive maintenance programs, no company beats our Toyota Forklifts of Atlanta. Our team of professionals has been doing it for decades! We would appreciate the opportunity to earn your business.